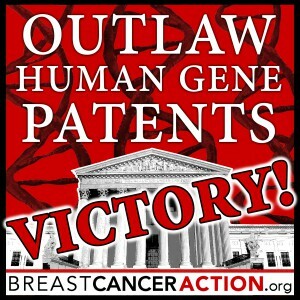 We are thrilled to report that human gene patents are now outlawed! After four years winding through the courts, the U.S. Supreme Court outlawed human gene patents ruling with Breast Cancer Action against Myriad Genetics, the company that first patented the BRCA 1&2 “breast cancer” genes. In mid-April, BCAction staff, board and members from across the country travelled to Washington DC for the presentation of oral arguments in the case. While Karuna Jaggar and former board member JoAnn Loulan went inside the Court to listen to arguments, we hosted a rally at the steps of the Supreme Court with signs and pictures and shared compelling stories about why human gene patenting is wrong. As a follow up to the decision, on June 25th we hosted a webinar to explore the implications of the for patients, research and the future of gene patents which included BCAction’s own Karuna Jaggar, Roger Klein, Molecular Pathologist at the Cleveland Clinic, Sandra Park, one of the lead ACLU attorney’s on the case, Ellen Matloff, Director of the Yale Cancer Center Genetic Counseling Program, and Kathleen Maxian, patient advocate & Co-Founder of the Western New York Ovarian Cancer Project. Attendees posed great questions such as “How will Myriad’s hoarding of masses of data on BRCA genetic sequence variants effect the quality and availability of clinical BRCA genetic testing by other institutions?”, “Does a US patent restrict companies elsewhere in world, such as Europe or India?” and last, “I am discouraged and amazed that only one breast cancer advocacy group stepped up. Were other groups invited to participate?” If you missed the webinar, you can watch a recording on our website. We are committed to monitoring the impacts of the Court’s ruling to ensure that the needs of patients come before profits for biotech companies, and to help women living with and at risk of breast cancer understand the benefits and limits of genetic testing. In recent months, we have continued to build our anti-fracking campaign by supporting rallies targeting the Democratic Governor’s Association in Maryland and Illinois. Many of the states that are on the frontlines of the fight against the fracking expansion in the U.S. are overseen by democratic governors, including Maryland, California, Illinois, New York and Colorado, and we want to make sure that the governors of these influential states understand the disastrous impacts that fracking has on public health and the environment. In April, we hosted a webinar, Fracking and Its Connection to Breast Cancer, outlining the connection between fracking and breast cancer. Jennifer Krill, Executive Director of Earthworks, and Karen Joy Miller, Environmental Chair New York State Breast Cancer Network, joined us as co-presenters. The Safe Chemicals Act was re-introduced in the Senate, and we support this very strong and much-needed bill. However, the Safe Chemicals Act was followed by the considerably weaker Chemical Safety Improvement Act which was introduced by a bipartisan group of 14 Senators. Read our longer article about these latest developments to understand why Breast Cancer Action is opposed to the Chemical Safety Improvement Act as it is currently written. Providing educational resources to our members is a critical service of BCAction. Our most recent webinar Separating Hype from Hope: Breast Cancer Media Literacy, included Gary Schwitzer, publisher of HealthNewsReview.org and Mandy Stahre, Epidemic Intelligence Service (EIS) Officer at the Centers for Disease Control and Prevention and reviewer for HealthNewsReview.org. We host highly successful and well-attended webinars every other month. We also completed two brand new factsheets, Ductal Carcinoma in Situ (DCIS) that offers a unique perspective on active surveillance and Health is More than Healthcare: Inequities in Breast Cancer, and last, we attended and presented at the California Breast Cancer Research Program’s (CBCRP) conference in Costa Mesa CA in May. Our Speakers Bureau program continues to grow. We are happy to welcome BCAction members Alma Williams, Donna Kaufman and Erica Concors to the Speakers Bureau. Over the last few months, our speakers have been busy representing BCAction at conferences, health fairs, classroom presentations and hosting their own fundraising events. Click here for more information about our Speakers Bureau program. Also, to learn more about why they are passionate about ending the breast cancer epidemic please see this issue’s Member Perspective highlighting some of our current speakers.